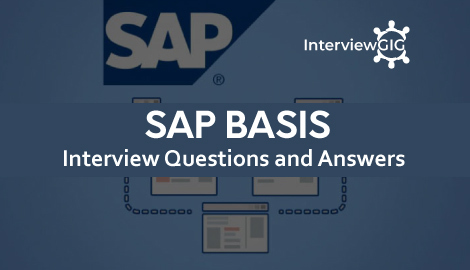 Here, we have listed all the Top SAP Basis Interview Questions and Answers for Freshers& Experienced. All the best for your interview Preparation. SAP basis acts as an operating system or a platform for SAP applications to run. It supports the entire range of SAP applications. System Trace: When you want to record internal SAP system activities, system trace is used. The trace is useful in diagnosis internal problems within SAP system and the host system. System Log: To know the recent logs for application server and CI, System log is referred. Developer Trace: In the event of problems, developer trace, records the technical information about the error or problem. For problem analysis and system monitoring Developer trace or System log is used. What are the different types of RFC? RFC (Remote Function Call) is a mechanism to communicate and exchanging the information between other SAP systems. How to perform a SAP-export and import tables in SAP from OS level? Step 2: Check whether enough disk space is available in the directory where you going to export. Step 3: Create two control files for R3trans which will be used for import and export. What is the difference between – support package, kernel and SAP note? SAP Note: An error in a single transaction or program is removed by implementing a SAP note. Kernel: Kernel contains the executable files (.EXE) like other applications and when a Kernel upgrade is done a new version of the EXE file replaces the older versions. What is the purpose of table TADIR? Table TADIR contains object directory entries. What is the difference between SDM and JSPM? JSPM (Java Support Package Manager) is used to apply support packages on deployed software components. In other words, it’s a tool that allows you to install the components and support packages. SDM (Software Delivery Manager) is used for importing Java Support Packages. To deploy and manage software packages received from SAP, SDM tool is used. What is the procedure to disable import all option from STMS in SAP? What is the different type of users in SAP? What is the use of reference and service user in SAP? Reference User: For this kind of user’s GUI login is not possible. What is SAP single stack system? A single stack system is defined by SAP system either with JAVA as runtime engine or SAP Netweaver as ABAP. What are the tools to install JAVA patches? To use the JAVA patches, SAP installer (SAPinst.exe) is employed. SDM and JSPM are the latest versions of tools used to deploy Java Patches. What is “Data Sets” in SAP? What is LUW (logical unit of work)? What is heterogenous system copy and homogenous system copy? Using BDC programming a data can be transferred successfully. There are 3 functional modules which can be used in a sequence. BDC _OPEN_GROUP: Name of the client, sessions and user name are specified in these functional modules. BDC_INSERT: It is used to insert the data for one transaction into a session. BDC_CLOSE_GROUP: It is used to close the batch input session. What is a background processing batch scheduler? To check the schedule background jobs and to execute them parameters like rdisp/btctime is used. These parameters define background processing batch scheduler. What is the purpose of TDEVC? The purpose of TDEVC contains development classes and packages. What are the types of work processes in SAP? What is the role of “Application Server”? What are the types of transport queries? What is the importance of table T000? Table T000 contains a list of defined clients, where we can maintain transaction code SCC4. SAPS stand for SAP Application Performance Standard, which is a hardware independent unit which describes the performance of a system configuration in SAP environment. What is the difference between Central Instance & Application Server? Central Instance has message server and dialog, update, spool, enque, gateway, background work processes. Application server has dialog, update, spool, gateway and background work process. What are the different types of transport requests in SAP BASIS? What is the difference between asynchronous and synchronous transport? Asynchronous Transport – Dialog or batch process is released after import is started. What is the difference between Consolidation and Development route? Default SAP systems are pre-installed with English and German. SAP does support many other languages which may not full translate from the default English and German. To fill this gap, Supplementary language (a program) is installed. It’s an old term for an implementation strategy. Blueprint -> prototype -> goLive (if you want to say it in one sentence).